Great listening to all these ideas on Davits. After seeing the Edson Stern inflatable C Hooks on a friends boat and liking the idea, I checked out the $400 price and decided that there had to be a cheaper way. 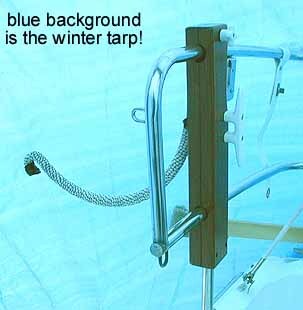 For the past two sailing seasons I have used a $15 system that has worked fine. The system consists of two home made mahagony mounting brackets that attach to the rear rails. 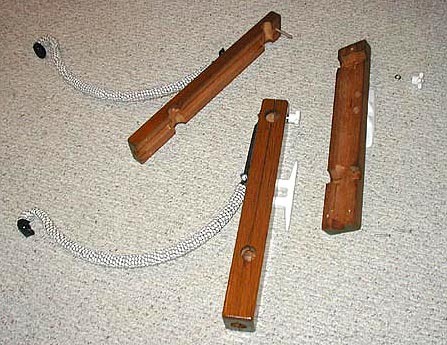 Attached to these are two "C’ hooks. These were made from,…..before you start laughing view pics above and see how nice they look……wall planter ($7.50 ea) brackets, turned upside down. With the $ I saved, I may be able to get my autopilot this year. The whole system is easily removable from the rails when not in use. 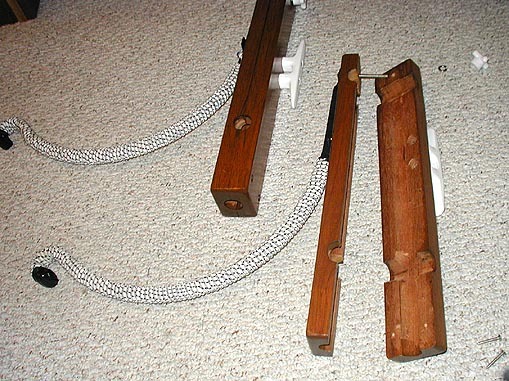 The brackets are wrapped in rope to protect against any abrasion on the inflatable dinghy. At the dock the dinghy is hung on the brackets and lashed to the boat so it does not blow away. Just like the using the Edson Stern inflatable C Hooks. As someone else explained, if it was left in the down position, then it would contact the water when the boat heals (I have forgotten and sailed in light winds this way) or those damn powerboats go by. 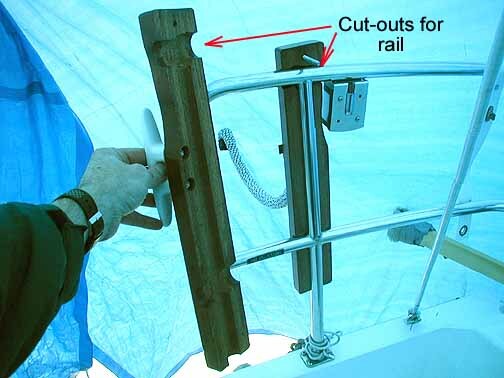 When I return to the slip, (pull in nose first) I release the halyard slowly and watch the dinghy swivel on the brackets back to the flat on the transom position. Now I am not paying for that extra 4 feet and the dinghy is high and dry. Sorry I don’t have an install pic, but you should get the idea by see the pics on my home page. Happy Sailing to you all as we freeze in the east. Thomas: I have the plastic "C" hooks mounted o the back of our C380. I used it for a while with our Seaworthy 9.2 inflatable. At dock or motoring it was OK. The dinghy was out of the way & relatively worry free. It did block the stern light. But, hey, who sails at night, right? ;-) Under sail, forget it! The stern tube drags in the wake once there is any heel to the boat. Lately I have taken to sailing long distance or in open seas with it lashed on the fore deck. Local cruises, I just tow it. At dock I hoist it on the dock float. I am at the end of our float so it's not in the way. We are going to Miami show in hopes of changing to a light RIB and dinghy davits.